On April 23rd, we have a joint training day between St Ivo School and Hinchingbrooke School. The focus of the day is independent learning and I am running a 20 minute workshop looking at Online Learning and how it can be used to try and support and encourage independent learning. The presentation is below and supporting booklet can be downloaded here: Online Learning Summary. Seen the TV programme? Now enter the competition! 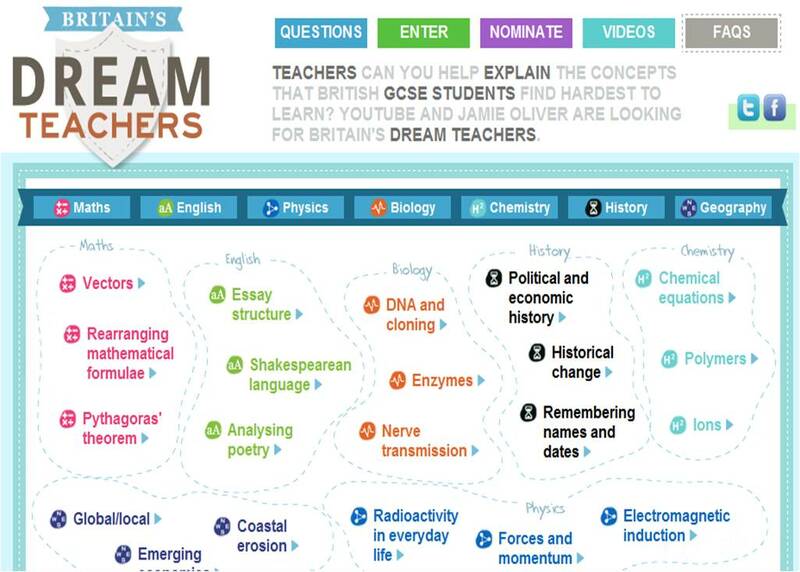 YouTube and Jamie Oliver are looking for Britain’s Dream Teachers in their competition in which they are looking for teachers to help explain the concepts that students find hardest. Through liaison with a major exam board, they have come up with some of the topics that students find hardest in seven topic areas: Maths, English, Physics, Chemistry, Biology, Geography and History. All you need to do is video your idea for teaching the concept and upload it to the competition website! The Prize?? There is prize for the best video in each of the subject categories – £3,000 for the teacher and £7,000 for the school! Interested? See the website for more details and to see which topics for your subject area you need to base your video on. Full competition rules are also available on the site! Go for it! The only problem is the deadline is very soon – all entries need to be uploaded before Tuesday 5th April!